This article is an excerpt from Oracle Dataguard — Standby Database Failover Handbook by Rampant TechPress. Data Guard Broker is an assisting utility provided with Oracle Database Server software to facilitate the creation and management of data guard configurations. (Note: Data Guard Broker is available with Oracle 9i Release 2 or later.) Data Guard broker consists of server side and client side components implementing a distributed computing architecture. The server side component includes a Data Guard Monitor (DMON) process and configuration files. The client side component includes Data Guard Manager and Command Line interface. Data Guard Broker manages a data guard configuration using a broker management model. The broker management model is a hierarchal structure comprised of Configuration, Site and Database resources. Broker can manage all three layers of the management model. We will see more about the broker management model later in this section. Data Guard Broker can manage the primary database and up to nine standby databases in one configuration. These nine standby databases can be a mixture of physical and logical standby databases. You can create a standby database using Data Guard broker, or add an existing standby database to a configuration. When you create a standby database using broker, broker takes care of the entire set of supporting files; e.g., SPFILE, Oracle Net configuration files, and so on. If you need to add an existing standby database to a data guard configuration, you must configure the SPFILE and Oracle Net files manually before adding the standby database to a configuration. If you plan to use Data Guard Broker for the management of standby databases, you must use the persistent server parameter file (SPFILE) to hold the initialization parameters on all the participating databases. It is a centralized management tool that can be used to manage the entire configuration using a GUI or CLI interface. It provides an extensive health check mechanism for the primary database, standby databases and supporting services in the configuration. It reduces the complexity of role management services. Switchover and Failover operations can be performed from a centralized console. It can be used to gather useful statistics to fine tune the log transfer and log apply services. The following subsections will explain the broker management model and the broker components in brief. Broker management model is a three layer hierarchical framework. 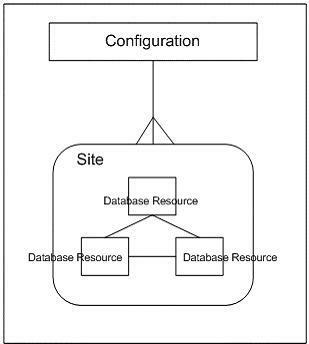 The logical units of the management model are Configuration, Site and Database Resources. These three layers bear a parent-child relationship as shown in the following diagram. Figure1: Diagram showing relation between layers of Broker Management model. A Database resource is the smallest unit managed by Data Guard Broker. In the broker management model, a database resource represents an instance of the primary or standby database. In addition, a service; e.g., log apply service can be classified as a database resource in context of a management model. Site in this model is a collection of database resources. In other words, a site is equivalent to a host machine on which a database instance is running. Configuration is the largest unit in the broker management model consisting of the primary site and one or more standby sites. Data Guard Broker can manage all three layers of the management model. Any operation performed on a higher level of the model is applicable to all the child objects of that layer. For example, if the status of a site is changed to offline, then all the resources under that site will be offline. We will learn more about the management model in Chapter 7. The server side component of Data Guard Broker includes the Data Guard Monitor (DMON) process and a configuration file. The Data Guard Monitor is a background process that runs on each of the sites managed by Data Guard Broker. The configuration file is a binary file that contains the properties and status of all the sites in a configuration. The DMON process is responsible for managing a consistent copy of the configuration file across the entire configuration. The DMON processes in a configuration communicate over Oracle Net to manage the role management and log management services. In addition, the DMON process gathers statistics about the health of a site that can be used for monitoring and fine-tuning. The following diagram shows a sample data guard configuration managed by data guard broker. Figure 2: Diagram showing server side components of Data Guard Broker. The Data Guard Manager and Command Line Interface (DGMGRL) make up the client side components of Data Guard Broker. Data Guard Manager is a graphical user interface integrated with Oracle Enterprise Manager. It contains several wizards to ease the management of a data guard configuration. DGMGRL or Command Line Interface provides most of the functionalities of Data Guard Manager and can be very useful to write custom scripts to automate data guard tasks. Chapter 7 provides the practical details of data guard broker. You will learn more about the server side and client side components in that chapter. Bipul Kumar is a Senior Oracle Database Administrator and Database Architect for an Electronic Media Company based in London, United Kingdom. His responsibilities include Oracle architectural design, defining policies and best practices, administering and maintaining the database, supervising oracle development and implementing new database technologies. He has more than seven years of experience in creating and managing Oracle Databases of varying sizes, primarily on UNIX operating systems. Mr. Kumar has a Masters degree in Science from the Indian Institute of Technology (IIT), Kharagpur, India and nearly ten years of experience in computing. In addition, he has acquired Oracle DBA certification for 7.3, 8.0, and 8i. His most recent book is Oracle Dataguard — Standby Database Failover Handbook.